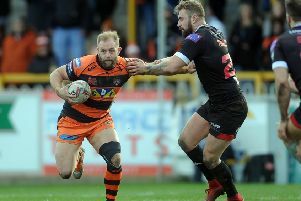 Michael Shenton passed 150 career tries and crossed the line four times as Castleford Tigers began their Super Eights campaign with a 36-30 win in an exciting game against Hull FC. Daryl Powell’s men came from 12-0 and 24-16 down to pick up a crucial two points in their bid for a top four end of season play-off place. The game had just about everything, brilliant tries, strange tries and controversial ones, but the Tigers found a way to get over the line and in the end deserved their victory after largely dominating the second half. They would have won by more if a few controversial decisions had not gone against them, but it would not be Cas if they did not do it the thrilling way. Castleford did well to turn round the game in the first half after they trailed 12-0 without actually having the ball in their hands. Hull looked sharp from the kick-off and scored back to back tries after being given two early penalties. First, Richard Whiting went over after passes by ex-Tigers Marc Sneyd and Joe Westerman. Then Jordan Rankin waltzed through a gap that opened suspiciously. With Sneyd kicking both conversions it was 12-0 and Cas did not what had hit them. The Tigers’ first possession saw them go close when Oliver Holmes was tackled in touch five metres out and Jake Webster was then pushed into touch on the other side of the field from the next serious foray into the visitors’ territory. Cas needed some great last ditch defending by Holmes and Ben Roberts to prevent Whiting from stretching the Hull lead. But on 23 minutes the hosts had their first score as Luke Gale’s grubber kick bounced off a Hull player and the loose ball was snapped up Shenton for the first of his tries. Three minutes later Shenton had another in similar circumstances when Gale’s high kick was taken by Tom Lineham, but the Hull winger then lost the ball in a crunching tackle by Justin Carney. There again to pick up and score was the Tigers skipper with Gale’s goal making 12-10. Another kick, this time by Liam Finn, resulted in a third Cas try when Shenton caught a high bomb and did well to get the ball down over the line. Gale converted to put the hosts ahead at 16-12, but Hull hit back right on the hooter with Steve Michaels going over in the corner following a succession of passes, at least one of which looked forward. Sneyd added insult to injury with a touchline goal to give the visitors an 18-16 interval lead. Hull followed up with a try in the second minute of the second half as Lineham raced almost the full length of the field to score after scooping up a loose Gale pass when it looked like the Tigers were going to score. Sneyd’s goal made it 24-16. It looked an uphill task at this stage for Cas, but they went on to dominate the rest of the half and they slowly but surely turned the screw. Shenton added his fourth try on 48 minutes after Holmes had come up with a great ball rip on Rankin and with Gale goaling they were back to two points behind. Gale knocked on chasing Roberts’ kick through as another try looked on then his kick was just too strong as it rolled to safety. Cas had a bit of defending to do and did it well when they took Micky Paea down inches short of the line. But they were soon back in attack and took the lead just after the hour. Great offloads by Junior Moors and Grant Millington led to Holmes making a break and Gale backed up to score a try he converted. Cas were controversially denied a further try when Shenton raced over again only to see his side penalised for an apparent obstruction by Carney as he chased Gale’s high kick. But two minutes later they were awarded a penalty for interference in the tackle and Gale sent the ball through the posts from 40 metres out to stretch the lead to 30-24. Roberts lost the ball over the line after backing up another great Moors offload and it seemed the Tigers could not quite put Hull away. Carney was next to look set to score as he superbly caught a Sneyd high kick and raced 70 metres downfield only to be caught. The Hull defence was still stretched, however, and eventually a gap was found for Ashley Gibson to score on his 150th career appearance. Gale’s goal made it 36-24. It was not quite all over, though, as Sneyd’s kick appeared to be knocked on by Hull, but Logan was allowed to collect the ball and race in for a try swiftly converted by Sneyd. That was the last score and Castleford saw the remainder out for their big two points. Scorers - Castleford: Tries Shenton 4, Gale, Gibson; goals Gale 6. Hull: Tries Whiting, Rankin, Michaels, Lineham, Logan; goals Sneyd 5. Castleford Tigers: Roberts; Gibson, Webster, Shenton, Carney; Finn, Gale; Lynch, McShane, Millington, Holmes, Moors, Massey. Subs: Milner, Cook, McMeeken, Springer. Hull FC: Rankin; Lineham, Sa, Logan, Michaels; Sneyd, Abdull; Paea, Houghton, Watts, Whiting, Minichiello, Westerman. Subs: Thompson, Paleaaesina, Green Yeaman.